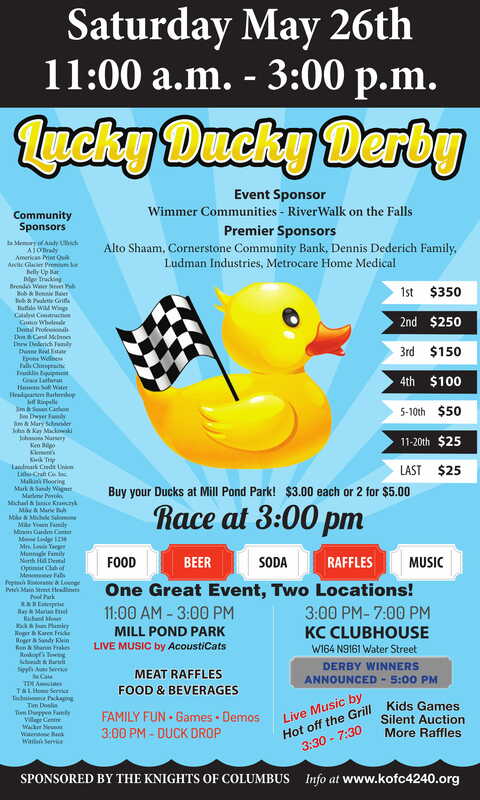 The Knights of Columbus Council 4240 in Menomonee Falls presents their annual Lucky Ducky Derby at Falls Memorial Fest. From 11:00 am – 3:00 pm, join the Knights of Columbus at Mill Pond Park for raffles, food, beverages and music by AcoustiCats. Ducks fly at 3:00 pm. The race starts just north of the Main Street Bridge at Mill Pond Park. Buy one duck for $3 or two ducks for $5. All money goes to the Knights of Columbus Charities. Tickets are available at the Village Centre BID office.